Indiana State University students huddled around classroom tables one fall morning carefully running their fingers over torn muscles. The topic of the day in Lindsey Eberman's orthopedic evaluation and diagnosis class was palpation. The patients were silent as Eberman's aspiring health care professionals practiced their palpation techniques - pushing and pressing on the ailing parts of muscles in an attempt to assess injuries. There were no groans of pain during this exercise, but at its conclusion the students had to be convinced to not taste their subjects. "Don't eat the Twizzlers," Eberman told the students. "If you want some licorice when we're done with this, there's more in my office." 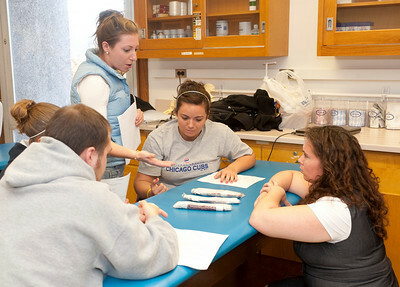 Eberman's decision to use cherry licorice twists to teach students the intricacies of feeling their way through a muscle tear is just one example of her non-traditional teaching techniques. During similar exercises on other days, students were blindfolded as they tried to feel what sort of coin Eberman had placed beneath a sheet of paper. As an assistant professor of athletic training who earned her Ph.D. in curriculum and instruction, Eberman likes to think outside the box - or even inside a licorice bag - for ways to help her students learn. "This came after six years of watching students struggle to learn palpation methods," Eberman said. "You begin to notice what their strengths and weaknesses are as a group ... and you have to modify your teaching." While Eberman was the idea person behind the licorice exercise, Megan Finn was the one who spent the evening before class winding tape around candy strands and looking for ample padding to simulate skin and tissue. Even she was learning from the experience. "Next time, I need to find the Twizzler twists," Finn said. "They feel more fibrous." "Mentorship is essential," Eberman said, "especially if the student has aspirations of getting a Ph.D."
That's why most evenings, Finn can be found on the athletic fields at Terre Haute South Vigo High School where she has the responsibility of working 20 to 30 hours a week with the school's athletic teams while simultaneously mentoring ISU undergraduate Kiersten Young. It's that hands-on approach to learning that influenced Finn to attend ISU. "I was looking for a graduate degree that would focus on athletic training, as well as gain more clinical experience," she said. "ISU has a great history with athletic training, great alumni outreach, so it was a good fit." While she works to share her expertise and refine her athletic training skills, Finn is also developing as an academic. She and Eberman are exploring a variety of non-traditional palpation instruction methods and together they're writing a paper about their findings. Finn is debating about whether she'll become a physician's assistant or obtain a Ph.D. to teach athletic training after she graduates. But she's confident that ISU is giving her the training she needs in order to be successful. "The alumni that come out of ISU for athletic training, they're all across the country," she said. "Just having such a large alumni base is definitely an advantage." Eberman intends to expand that alumni base even further. With the ultimate goal of producing a greater number of graduates, Eberman is fostering relationships with Terre Haute-area organizations and businesses to create more opportunities for students to gain clinical experience. "As much as we are doing hands-on work in the class, we are expanding that out into the community," Eberman said. "In the last year we have doubled the number of clinical sites that we have." All of these efforts showcase Eberman's commitment to help students learn in the most effective and creative ways possible. Whether she's sharing leftover licorice with her students or placing them in learning situations outside the classroom, Eberman has students' best interests in mind. "There's a whole variety of different ways to teach that don't include ... a lecture and a Powerpoint," she said, and "if we don't stress to teachers how important this is, our students will never benefit." Contact: Lindsey Eberman, assistant professor of athletic training, College of Nursing, Health, and Human Performance, Indiana State University, 812-237-7694 or lindsey.eberman@indstate.edu. Cutline: Sophomore athletic training major Kiersten Young listens as graduate student Megan Finn explains how to work with an injured Terre Haute South Vigo High School student (Kara Berchem/ISU Photography). Cutline: Students in Lindsey Eberman's (right) orthopedic evaluation and diagnosis class listen as Megan Finn (standing) explains how strands of licorice help simulate a torn muscle (Kara Berchem/ISU Photography). An ISU professor is employing non-traditional teaching techniques both in and out of the classroom, all in an effort to help students achieve their goals.